Sort, Clean & Organize Your Scrap For Extra Cash! I hope this finds you all doing well and enjoying these winter months. I know this time of year you may not be thinking too hard of going outside and digging out your scrap metal. But, devising a plan now could save you some time when you are ready to turn that recyclable material in for some extra cash. There are some things to consider while getting ready to prepare items for recycling. Many of them can help you get the most out of your metals. First, can you sort out any metals that may be worth more? Common metals that you could sort from your steel are aluminum, copper, and stainless steel. Many wires have aluminum and copper which you can bring in to have graded for premium prices. To make sure you have stainless steel, take a magnet to it. If it is not magnetic, you should be on the right track. Another thing to be mindful of is how well you can clean up your materials. An example would be stainless steel pig feeders. Many yards pay better for clean stainless steel as opposed to a lower percentage. The biggest thing is to cut off any steel, plastic, or rubber that may be attached to the feeders. Aluminum works the same way. You just have to decide if your time cleaning it is worth the better price to you. Finally, think about the amount or size of materials you need to handle. It may be worth a call to us to see if we can help with cleaning up, providing a roll-off box, or hauling larger items such as combines or equipment. We have the resources available to help save you time and get your scrap cleaned up. 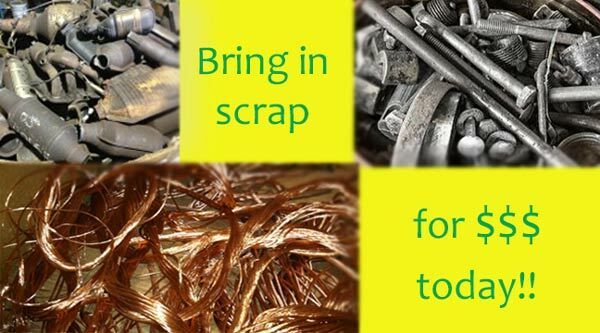 So, if you’re looking for something to do while waiting for the weather to clear up, think about sorting, cleaning, or organizing your scrap so it’s ready to go when you are. Please don’t hesitate to call us or stop in with any questions. You can reach us at 712-476-4500.